Blend smart technology with the human touch to improve customer experience. It is hard to believe it now, but artificial intelligence used to be nothing more than a futuristic dream. It was portrayed in old movies as the vehicle that would completely change the world and propel our culture to unimaginable heights. Now, artificial intelligence—the stuff of the future—is all around us, and we are still learning just how much it can benefit us. In addition to improving our daily lives by helping us find restaurants, driving us around in our vehicles, and even controlling the lights and appliances in our homes, AI is improving the world of business in a variety of ways. 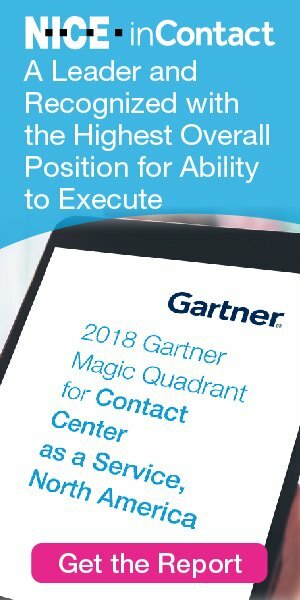 Automated systems are especially helpful for call centers, so much so that Gartner predicts that non-voice interactions in customer service settings will likely rise to 85% by 2020. Many contact centers are discovering how AI can benefit them and help them turn a greater profit while serving customers’ needs more effectively. If your contact center does not currently make use of AI, you may be spending more than you need to and are likely to be missing out on your full potential to meet the needs of your customers. While self-serving options are becoming more and more popular, consumers still want the ability to speak with a live customer service agent if needed. When you offer digital solutions that recognize and predict the needs of your customers, you create a seamless user experience. Don’t get me wrong, artificial intelligence should never replace the human component of your contact center; however, it is very beneficial in helping contact centers handle much larger volumes with greater efficiency. One of the most common challenges all businesses face is how can they improve their customer experience. In fact, 72% list customer experience improvement as their top priority, according to recent data published by Forrester. Call centers that experience a high volume of customer service calls may consistently struggle to deliver a quick and effective customer service experience. NewVoiceMedia reveals that companies in the United States lose approximately $62 billion each year as a direct result of poor customer service, hence why it is imperative for companies to turn the statistics in their favor by taking actionable steps to improve the customer experience. One of the most effective ways to do this is by incorporating artificial intelligence into their call center processes. To speak more to the last bullet point, companies had greater control over the conversation in the past. Companies told consumers what was important, what they should buy and when they should buy it. And customers listened. In today’s world, where virtually every market is saturated with competition, companies have fallen away from the importance of creating a relationship with their consumers and have been too focused on making the sale and moving on to the next opportunity. Machine learning and speech recognition systems can help companies get back to those relationship-style interactions by allowing centers to listen to 100% of their interactions, not just a fraction. Having this data readily available at your leader’s fingertips allows them to more effectively coach their team members on individual areas of opportunity, hence creating a higher and more desirable experience for your consumers. Customers expect an “easy-button” experience, no matter how complex the product or service. If a product, service, interaction, information search, etc., doesn’t happen the way a consumer expects, they don’t think twice about disengaging. There’s no stickiness; no pain associated with walking away. By equipping your team with the proper technology and training, and developing analysts to recognize and act on this data, your company will almost immediately begin to see the positive impacts that this technology can have when partnered with the human touch. If you were to ask 10 different companies for the definition of “excellent customer service,” you would probably get 10 different answers. There is no single definition of superior customer service that can be applied to all businesses. For this reason, creating a standardized checklist to achieve remarkable customer experience can’t simply be rolled out to all centers. The challenge of determining, analyzing and enforcing behaviors and actions that meet excellent service standards for your business most likely falls on the shoulders of your quality monitoring group. Their task is a monumental one, but it is necessary for delivering a concise, uniform approach to customer service. By implementing trusted AI software, it is possible to increase the effectiveness of your QM team. Data provided by the AI software can direct the team to frontline improvement opportunities much quicker than the traditional method in which leaders only monitor three interactions per agent per week. The result is an expedited improvement in your center’s customer interaction processes. Artificial intelligence, when used correctly in a call center, can effortlessly monitor and gather valuable data from your team’s phone calls, chats and emails. It can also assist management in identifying opportunities to improve customer satisfaction, sales conversions and processes. Speech recognition technology is capable of anticipating customer needs and quickly delivering predictions and solutions that are specific to each individual. This level of customization can have a major impact on the customer-business relationship. While automated QA programs are efficient and can be used to deliver a convenient and consistent experience to each customer, human intelligence and adaptability will always be needed to assess performance, provide feedback and coaching, and make gentle corrections as needed. Additionally, automated systems will always have limits, especially when customers call in with complicated questions, complaints or needs. Having a live agent available to overcome these limits and provide assistance to the customer in real-time can ensure that automated experience never becomes a hindrance to the customer experience. History reminds us that the Industrial Revolution was feared by many and was predicted to destroy the workplace as humans knew it. But we all know that did not happen. Although the Industrial Revolution did shake things up a bit and ultimately resulted in a decrease in human farming jobs, it also led to an increase in white-collar jobs such as business consulting and stockbroking. The coming AI revolution is similar in that it will likely lead to new opportunities. Embracing, rather than fearing, technology can have a positive impact on business. Gartner predicts that 20% of companies will need dedicated workers to guide and monitor artificial networks by 2020. AI will be especially valuable for companies that have large data sets that cannot be adequately analyzed or understood by humans on their own. The Intelligence Revolution will most likely decrease the need for human beings in certain types of jobs, but it will inevitably create new, unprecedented positions that will open exciting doors for professionals. Forrester predicts that the cognitive era will create approximately 8.9 million new jobs by 2020 in the United States alone. While future possibilities for AI are practically unimaginable, it is important to remember that machines will never be as adept as humans at thinking creatively, making quick assessments and judgments, or connecting a variety of seemingly unrelated ideas. As with every previous revolution throughout history, integrating AI into daily call center business operations has the potential to reshape the workplace and provide unimaginable opportunities for growth. The Intelligence Revolution has the potential to bring us all to an improved era of innovation where man and intelligence work together to create a superior customer experience. In a perfect contact center world, machines that are programmed by agents would be capable of handling almost every issue that arose. Each call and resolution would be part of a continuous loop from which AI would gather and evaluate information and immediately feed it back into the ever-learning system. Though this may sound like the ideal scenario for call centers around the world, customers today expect human interaction to feel that they have received excellent customer service. Intelligent automation can help call centers to move customers gently to a place where they realize just how beneficial technology is. For instance, some call centers can now send photos or information directly to the smartphone of a client during the call, cutting down on additional questions and possible frustration. Creating the right mix of smart technology and live agent support can give your call center an advantage over competitors who do not achieve a good AI/human balance. Once you have obtained the right combination of technology and human support, you will enjoy a smarter and more efficient call center environment that is capable of meeting the needs of your consumers and delivering a more enjoyable customer experience. Jim Iyoob is EVP of Customer Experience for Etech Global Services. He has 20+ years of experience in inbound, outbound, chat and social media operations, and is a respected speaker and author for call center solutions.